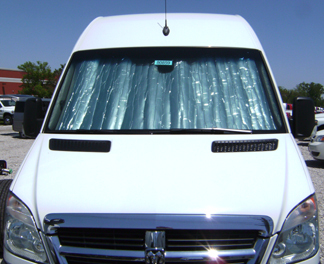 Custom made and fitted to your 2010 - 2013 Ford Transit Connect Van or Wagon, our sunshade keeps your vehicle cooler and protects your interior from harmful UV rays. Rolls up and stores easily. Sunshade has sewn in binding and velcro strap. Made in USA. Usually ships in 1-2 business days. Please allow 7-14 days for delivery. *Free shipping available within the US by FedEx Ground. If you are located outside the US, or any US territory, we will contact you with a total cost with shipping before we charge your order.